A galette is traditionally a round, flat sweet dish with a pastry or pancake-type base. This rectangular puff pastry version is topped with Pink Lady apples, a summer eating variety that has a wonderful colour and flavour. Try this recipe, served hot or cold, instead of an apple pie. Preheat the oven to 200°C, gas mark 6. Roll out the pastry onto a lightly floured board into a rectangle measuring 38 x 16cm. Transfer to a baking tray. 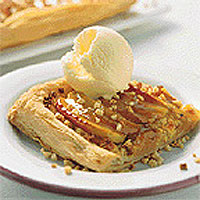 Combine the ground almonds with the apple juice and spread over the pastry base to within 1cm of the edge. Arrange the slices of apple over the almond mixture, gently heat the honey and brush over the apples. Bake for 20-25 minutes or until the pastry is golden brown. Place the chopped mixed nuts on a baking tray in the oven for 10 minutes or until golden. Heat the apricot jam until bubbling, allow to cool slightly, then sieve to remove the apricot pieces and brush over the apples to glaze. Sprinkle over the mixed nuts and serve warm or cold with crème fraîche or ice cream. If you prefer, make 4 individual galettes by cutting the pastry into 4 pieces and rolling out into 10 x 16cm rectangles. For a subtle brandy flavour, replace 1 tbsp of the apple juice with calvados. This recipe was first published in July 2001.